Performance still tops the list of consumer concerns. The loading capacity often takes the back seat for consumers who want to have a more easier time dealing with dirt and stains on their laundry. So even if the Samsung WF337AAL has a four cu. ft. capacity, what interested buyers would really love to know is if this washing machine can do a fine job at laundry cleaning. The SilverCare cleaning system starts out with two plates of material that are 99.9% pure silver. Through electrolysis, silver ions are forced out of the plates and into the laundry load. The silver ions aid in sanitizing and cleaning your clothes. Through the SilverCare treatment, 99.9% of the odor-causing bacteria in your garments are sanitized for a fresh-smelling, clean laundry after every wash. The SilverCare system even contributes to this washer's efficiency, because the washer doesn't use extra energy to heat the water for sanitizing the clothes. Instead the SilverCare setting can be set for cold water sanitation. 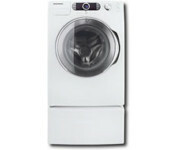 Like many other washers being offered by Samsung, the WF337AAL is fitted with Vibration Reduction Technology. Basically, this technology makes use of suspension and springs to balance the load and the machine while in operation. By reducing the vibrations generated by the washer, the Vibration Reduction Technology also helps in silencing the machine and keeping it from “walking around." Another great feature of the Samsung WF337AAL is its direct drive inverter motor. The motor is built without belts and gear. With less moving parts than other types of motors, the motor is more durable, smoother, and quieter as well. This washer has an LED console in white red and blue that helps users know exactly what cycle and wash options are activated on the machine. With the Graphic LED Console, the washer is easier to understand and control. One of the advantages of the Samsung WF337AAL is having numerous settings and options. This washer has a total of 12 wash cycles, seven wash options, five temperature settings, a custom temperature setting, five spin speeds, and three soil levels. Consumers can even wash wool garments in this washer, because it is Woolmark certified. The main advantage of the Samsung WF337AAL is its energy-efficient design. The front-loading configuration, large capacity, and SilverCare technology all help to make this washer more environmentally-friendly. This washer is not not only good to the environment, but also to the wallet. Because of its efficient use of water and energy, this washer helps you save on power and electricity bills. Another great advantage consumers have cited is that the washer can run smoothly and quietly, even on the highest spin setting of 1,300 rpm. The Vibration Reduction Technology and the Direct Drive Inverse Motor both help reduce the number of moving parts in this washer, while aiding in balancing the machine while in operation. The biggest disadvantage of this washer is its price tag. It costs over $1,000, and not all people are willing to spend over $1,000 for a washing machine. If people can get over the price tag, however, they may soon realize that this is a good investment, because they get to save on your utility bills. Another disadvantage of the Samsung WF337AAL is its user's manual. The instruction manual that comes with the machine is hard to understand and some have even gone as far as to saying that it's useless. Still, those who are willing to take some time to get to know the functions of the washer will surely benefit from its wide variety of settings and features. The Samsung WF337AAL is a great washing machine. This machine can handle different types of laundry needs. It's hard to beat a front-loading washing machine with four cubic feet of capacity, tons of settings and options, a durable build, and advanced technologies. This washing machine does its job effectively, efficiently, quietly, and conveniently. Anyone who is looking for a washing machine would probably be proud to choose this washer. Save yourself the frustration buy something else. My WF337AAL is five years old and is in need of $600 in repairs. This is not due to over use (only 2 of us live in the house) or abuse just simple part failure. Our washer has (WF337AAL) had a number of problems since new. The final straw is its inability to spin without vibrating & shutting down. It does have VRT & we ensured that it is balanced etc etc. But it's a frustrating expensive piece of junk after 4 years. Our last washer was a 12 year old Top Load & we retired to one of our rentals & is still going strong after 4 more years. WHERE IS THE FILTER LOCATED IN ORDER TO CLEAN. MANUAL IS NO HELP. MACHINE DOES NOT SPIN BECAUSE THE FILTER NEEDS TO BE CLEAN. CALLED SAMSUNG AND THEY ADVISED ME TO CALL SERVICE DEPT. SAMSUNG IS NO HELP AND WOULD NOT BUY ANOTHER ITEM FROM THEM.